I have so many “healthy living” thoughts in my head each day and I just have to get them all out (sometimes in a completely random fashion). My skincare business is picking up. Thank You! You might remember from this recent post, I am running my scratch kitchen with no sink and no countertops. My new kitchen goodies cannot be installed soon enough, I tell ya! I think I’m still about a week out. So, yesterday I wrote about a lovely flower called the Calendula and explained why you should grow them (they are pretty, they taste good, and they should be in your medicine cabinets). 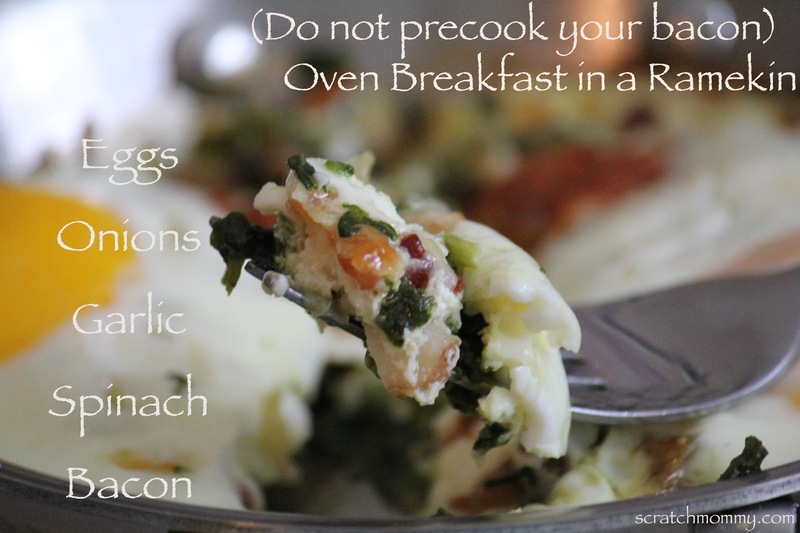 Moving right along in my scattered blog randomness, why not skip today to a post about an easy, tasty breakfast treat? His love for bacon comes honest. I woke up this morning and I’m pretty sure that Baaaacon was the first thing that ran through my mind. Okay, easy enough. I can do that. Let me just play with Oliver and then flip through Facebook for a bit before getting started. That’s when I saw three (yes, three!) 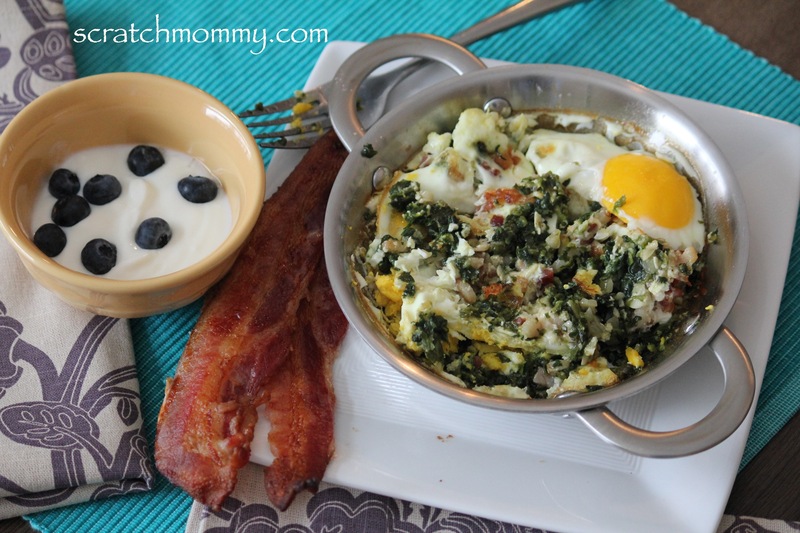 very similar recipes online for an individual oven baked breakfast: Baked Eggs w/Spinach and Bacon. Oh H*#& Yes! THAT sounds great! Okay, so I mentioned that I am not working at full capacity in my kitchen right now, which means that I’m attempting to keep my cooking and baking cleanup to a minimum…and I’m always looking for quick in the kitchen. That said, all three recipes said that I needed to cook the bacon first and then put it into the ramekin for the “mini-casserole,” (if you would). I searched and searched online and found multiple recipes which were very similar, but I could not find a one that suggested you actually cook the bacon in the “mini-casserole,” (if you would). Hmmm. Then, the phone rang. I talked with my good friend and neighbor for a little while and I explained my quandary to her. 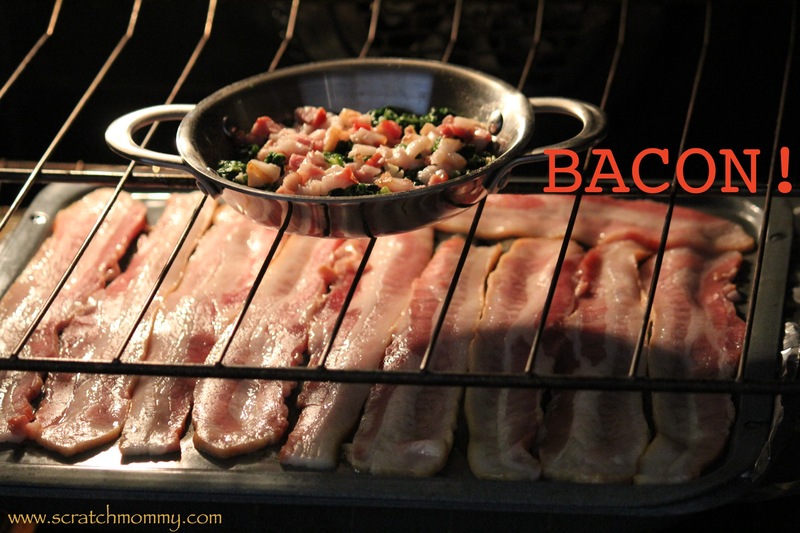 She suggested that people may pre-cook the bacon for two reasons: they want crispy bacon and they want no grease. 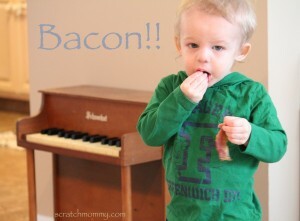 Agreed, I want crispy bacon, too! So, here I go…into the kitchen to make way too big of a mess for a scratch mommy with no sink and no countertops, but I just HAD to figure this out. I was determined to cook not only a cute little ramekin “mini-casserole,” (if you would) but also cook the remaining bacon…at the same time. Again, I’m all about saving time in my kitchen! 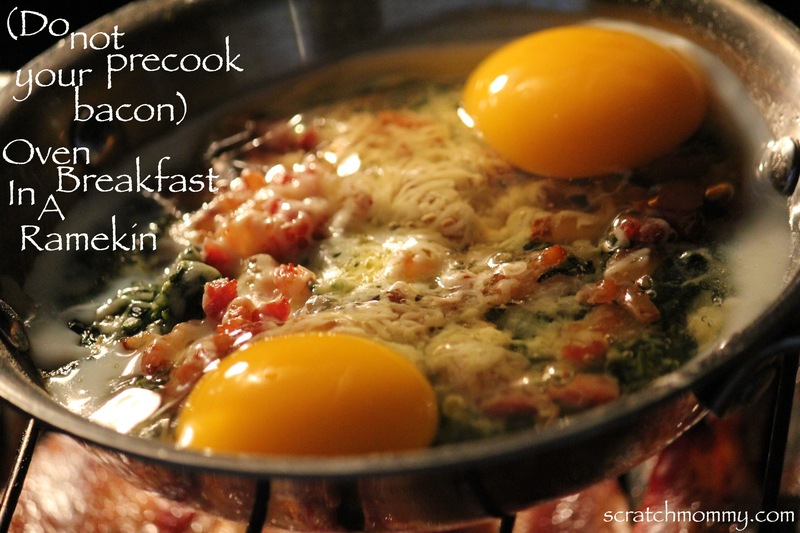 You’ll also need a ramekin (…or a small omelet pan, which is closer to what I use). 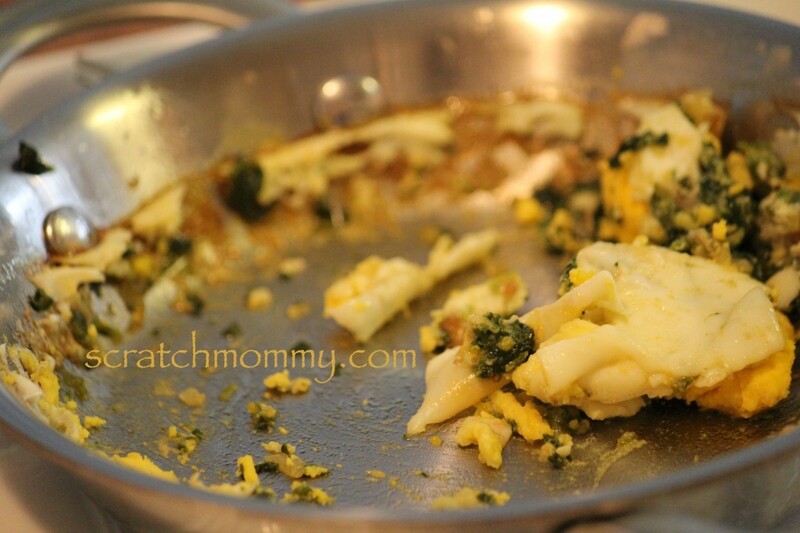 I have this Calphalon omelet pan (similar to the one pictured in this post) and absolutely LOVE it. Cut 1-inch off the end of your bacon. Dice it and set aside. (I then put the remaining bacon on my roasting pan…lined with foil…so it was ready to go in the oven at the same time as the “mini-casserole,” if you would).Place butter and milk in greased ramekin; add onions and garlic, then add spinach on the top. Add salt and pepper to taste, then top with raw, diced bacon. (I guess if you already have cooked bacon on hand you could use it, too…it’s just that bacon never lasts long enough in my house to make it to the fridge after I’ve cooked it). Bake for 25-30 minutes, until bacon is browning. (I baked the bacon on the bottom rack and “mini-casserole” on the top). Remove casserole, top with cheese and crack two eggs on top. Put back into oven for approximately 4-6 more minutes (until the eggs are to your liking). So, what do you think? Did this work? Holy Moly, YES!!! It was soooo good. I will definitely be making this again soon. I will add some tomatoes next time…yum! The bacon was perfectly crispy! I think the key is leaving it on top before adding cheese and the egg to the top. Oh, and as for the grease…yes, there was about 1 teaspoon of grease that came to the top. I didn’t mind it being there, but I wanted to see if it was a big deal to pour it off. Nope, I just leaned it over my trashcan and out it went. Hooray! What a timesaver this was, and so yummy, to boot. What do you think? Is this something that you will try in your kitchen? This post was shared at– Foodie Friday, Friday Flair Link Party, Thank Goodness It’s Monday, Tasty Tuesday, Making a Home, Catch A Glimpse Thursday, Strut Your Stuff Saturday, Saturday Spotlight, Hunk of Meat Monday, Fat Tuesday, Fight Back Friday. One reason to pre-cook your bacon: So you can pour it into a container and save it for cooking other things! If it’s just the bacon grease you can do that, but if it’s got spices and spinach juices and the like, it’s not going to be as universally useful and may in fact go bad much more quickly. Oh yes, of course! I cook my bacon (typically) in the oven and save the grease, or cook it in my cast iron and save that grease. 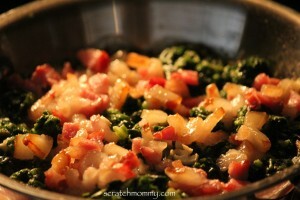 I just find this particular breakfast casserole recipe to be super handy when you don’t have pre-cooked bacon on hand.